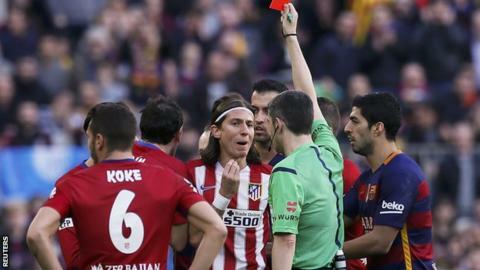 Diego Simeone refused to criticise Filipe Luis and Diego Godin after the Atletico Madrid pair received red cards in Saturday's 2-1 defeat at title rivals Barcelona. Luis was sent off for a first-half challenge on Lionel Messi described by Barca coach Luis Enrique as "shocking". Godin received a second caution for a late challenge on Luis Suarez, who earlier scored the winning goal. Atletico coach Simeone said: "I have nothing to reproach them for." Even with nine men Atletico were not overwhelmed by the champions but Simeone admitted Barcelona may be difficult to catch in the title race. He added: "They have players who decide games, a three-point lead, and a game to play. The league is long, but they don't stumble very much. "I am proud of my team. It kept its character throughout. You can win, or you can lose, and I choose to lose this way any day. Barcelona are unbeaten in La Liga since early October but despite pulling clear at the top of the table with a game in hand, Enrique insists a successful title defence is not a formality. He said: "It is clear it is an important day for us to pick up three points against our closest rivals, but there is a long way to go. "Every game presents its difficulties and you don't always overcome them in the most effective or spectacular way."